The Columbus Blue Jackets on Tuesday made the decision to keep rookie center Ryan Johansen with the team for the foreseeable future. Johansen, the No. 4 pick in the 2010 NHL Draft, has 2 goals, 4 points and a plus-1 rating in nine games this season. Both his goals have been game-winners. 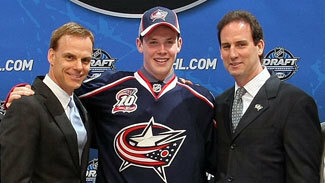 Once Johansen steps on the ice for his 10th game, the first year of his three-year, entry-level contract will kick in. The Blue Jackets are home to the Toronto Maple Leafs on Thursday and in Philadelphia to face the Flyers on Saturday. The move to keep Johansen comes at a time when the team is short one center with Jeff Carter sidelined with a fractured foot. According to The Columbus Dispatch, Blue Jackets general manager Scott Howson and coach Scott Arniel spent the last two days contemplating the decision whether to keep Johansen or return him to the Western Hockey League. "We have decided to keep Ryan Johansen through the 10-game thresh-hold, which means the first year of his contract will apply to this season," Howson announced via his Twitter account. If Johansen was returned to the Portland Winterhawks of the Western Hockey League, he would have become a restricted free agent after the 2013-14 campaign. The 6-foot-3, 203-pound Vancouver native had 40 goals and 92 points in 63 games with Portland last season. He also had 3 goals and 9 points in seven games for silver medal-winning Team Canada at the 2011 World Junior Championship. "There have been moments where he's looked very good and moments where he's looked like a 19-year-old finding his way in the NHL," Howson told the Dispatch. "But he was better in game nine than he was in game one."